This Rushmere is not to be confused with the large north-eastern suburb of Ipswich which is home to some 30,000 people. We are forty miles to the north here, in the remote and narrow lanes between Lowestoft and Halesworth. There is no real village centre, and the population of the parish is best measured in tens rather than thousands. At the time of White's Suffok 1844, there were 134 inhabitants, and there are probably fewer than that today. Nevertheless, the huge Ipswich suburb is always referred to as 'Rushmere St Andrew', whereas this tiny, remote parish is simply Rushmere. Coming back to Rushmere on a sunny day in late summer, my heart was gladdened to see the flag of St George fluttering proudly against the blue Suffolk sky from the top of the tower. This is not simply because I am a stout-hearted Englishman: when Cautley's revising editors visited this church in 1975, they found it disused and abandoned. It had been declared redundant, and a decision was taken to derelict it. 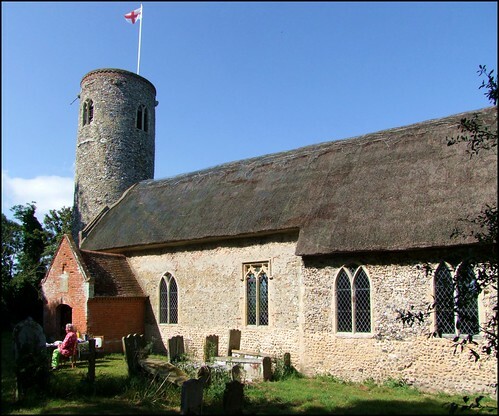 The roof was removed, the furnishings dispersed,and the intention was that it be left to quietly fall, a more common fate for redundant churches in Norfolk than in Suffolk. Ironically, it was perhaps that the parish church at neighbouring Mutford had also been declared redundant which galvanised local people into action. One lost church is unfortunate, but two looks like carelessness, and today both Mutford and Rushmere have working churches again. When Sam Mortlock visited in 1990 the church was still in a derelict state, but already he saw how local people were doing something about it. The reeds were stacked ready for thatching, and the walls were being repaired. Visiting today, you can immediately see the difference that local pride and loving care can make. For this little church, which has suffered centuries of neglect, stands trim and proud in its pretty churchyard in the middle of nowhere, with a couple of cottages for company, at a crossroads among the angelica-lined lanes. When I first came here in the late 1990s the church had been repaired and returned to use; but it was being kept locked without a keyholder, which seemed a terrible shame, considering the terrible fate it had only just avoided. Back then, I could only stand at a window and stare in. Today, there is an available key - although, of course, there is no reason why St Michael should not be open every day, as neighbouring Gisleham is. It would certainly make it safer from burglary and vandalism. This is a tiny church, making the little tower seem larger than it is. Stepping through the little porch you enter a narrow space. You have to edge your way past the grand 15th Century font; in fact, it used to be worse, but the Victorian wooden platforms to the seats have been removed. They had rotted after being the victims of years of Suffolk damp. Like most churches around here, St Michael is a long, tunnel-like building, with no aisles and no real division between nave and chancel. There is no ceiling, so the inside of the thatch is exposed, which is delightful. On the north wall is the war memorial, stored for many years at Mutford, but now returned to its rightful place. It is similar in design to those at Mutford and Gisleham. On the wall opposite it is possible to see the great treasure of Rushmere church, a wall painting of St James in the eastern splay of a window. He is faded, but the outline is clear; he holds his pilgrim staff and his rosary beads hang down from his belt, a reminder that prayers have been answered here. There is another exposed section of wallpainting to the east, a decorative border which makes you wonder what else remains to be found. Outside in the graveyard is the somewhat exotic sight of a 19th Century headstone with a machine gun bullet hole through it. It fell victim to a German raider attacking a navigation light to the east of the church during the Second World War. Even more exotic is the memorial to the north of the church which commemorates two Spiritualists. It dates from the 1920s, when the enthusiasm for Spiritualism was at its height in the years following the carnage of the First World War. It records that the Bugdens, husband and wife, have Passed Beyond, and that they, Through Faith and Patience, Kept the Promises.